Reliance Jio engineers make a useful application for android users device administrator permission name JioSecurity. It is protect Contacts, Email, Bank Info, Passwords and Personal Messages. 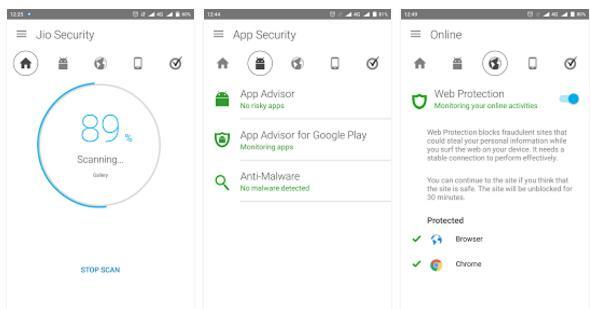 It’s also a free Anti Virus application that is powered by Norton Mobile Insights protect your device. It identifies dangerous websites and scans downloaded apps, app updates, and SD memory cards to detect and eliminate threats that are designed to steal your information for money. It provides virus protection against risky apps and it could safely your personal information and content, use battery and data, too slow your device. The application can help you get back your mobile device if missing lets you send a text to your device that sets off a “scream” alarm, so you can find it fast if you misplace it. And if your mobile device is lost or stolen, you can remotely lock and locate it with a text or through any Web browser. If you are accessing internet using Jio network simply use “Skip Sign in” option to activate JioSecurity. Other SIM or network users need Jio Id and password, then user can login and activate. New user can use signup option on login page to create Jio Id and password; this needs a valid Jio sim number. One JioSecurity subscription can protect up to ten mobile devices. Users get the Jio ID when you download and register for My Jio application. So JioSecurity application gives you in control of your digital experience.